We’re now back from two glorious weeks in Dorset, for a full-on bucket and spade, bring on the beaches, add ice cream kind of family holiday. If you follow me on Instagram, you might already have seen a few flower photos from places we visited – do come over and say hi. Holidays can be really expensive, when you add up all the food, outings, tickets, toys and the sack of coins just for parking. Sure, with all the family outings we spent more than a normal couple of weeks at home. True to form however, I still took a money saving approach. I intended to write a nice, quick post, but then got a bit carried away. So here’s a summary list of the top 10 things we did to cut the cost of a fun family holiday, with more below if you’d like extra details and pics! 1. Prepare for packed lunches. Save a small fortune compared to eating out every time. 2. Bring on the beaches. Fun for hours with waves, sand, shells and games – when sunny. 3. Bag board games from charity shops. Stock up on entertainment at pocket money prices. 4. Go to the cinema for less. Plan A for rainy days, with inexpensive children’s showings. 5. Locate the local library. Warm & dry with wifi, plus borrow books on a visitor’s card. 6. Make the most of membership. Joined English Heritage or the National Trust? Use it. 8, …and book online in advance. Save by booking beforehand, don’t just rock up on the day. 9. Hang on to annual tickets. Just in case you do get the chance to return. 10. Check out church fetes. 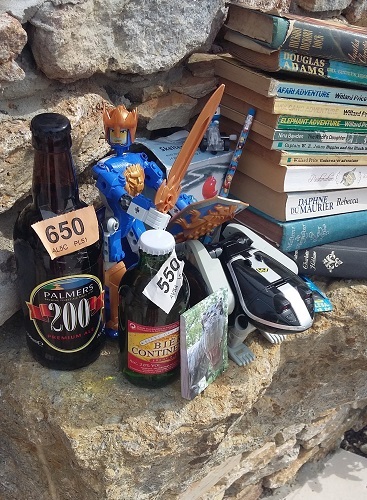 Cheap books, cheaper toys, cream teas, brass bands & raffles. Fab. 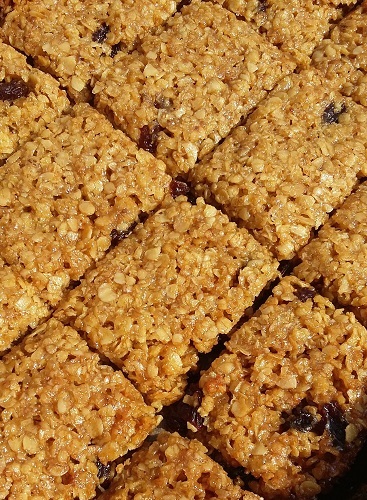 Yummy flapjack for packed lunches. It’s got oats and raisins, so pretend it’s healthy. Yes even on holiday – especially on holiday – I made packed lunches whenever we went out for the day. Taking your own food can save a small fortune, compared to the cost of eating out every time. Taking packed lunches also left more in the budget for ice creams all round afterwards. Plus it made the one lunch out with the grandparents, at the highly-recommended Hive Cafe, particularly special. 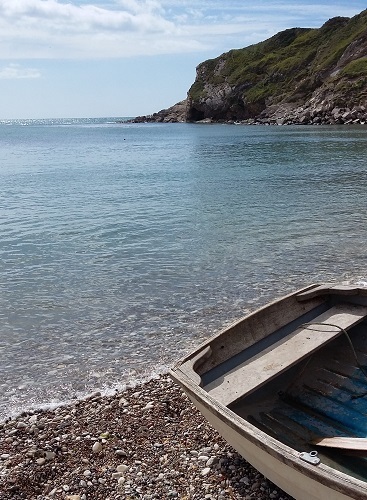 Sun, sea and shingle at Lulworth Cove. Just beautiful. Even the most screen-hardened, tech loving children might still be prepared to enjoy themselves on a sunny beach. For the cost of a few pounds for parking, we spent hours on assorted beaches along the truly beautiful Dorset coast, from Lulworth Cove to West Bay via Charmouth, the Hive beach and Church Ope Cove. The kids could paddle, jump over waves and even occasionally brave swimming. We lugged along buckets and spades for essential sandcastle building, hole digging, human burial, mermaid creation, beach decoration and stone collecting, with the odd attempt at fossil hunting. Add in a ball, a kite or a frisbee and you’re away. Thank goodness the weather was kind. And thank goodness my children are now 6 and 8, so I could sometimes take a break with a book, rather than leaping up every two minutes to rein in toddlers set on certain death. Bridport: a fine source of charity shops. The beaches were fab, but as ever with a holiday in England, it’s not realistic to rely on constant sunshine. Charity shops are a great place to stock up on low-cost entertainment for rainy days. Before we left, I picked up a new board game, Othello, for £2.50 from our local Sue Ryder shop, which generated much family rivalry. While away, doling out a couple of quid to your kids to spend in charity shops can be a great way to keep them busy, and get much more for their money. We spent a happy morning pottering round the fine charity shops in Bridport, where my son insisted on buying a travel version of Connect 4. Best 75p ever spent, as it kept us all quiet for ages and even came in handy on car journeys. Our plan A for a rainy day is always to head to the local cinema. If you can lever yourself out of bed, tickets for early morning children’s film showings can be super cheap. Think from £1.80 a ticket at Cineworld Movies for Juniors, £1.99 at Vue’s Mini Movies or £2.50 with Odeon Kids, for films a few months after their initial release. We headed into Dorchester, and splashed out an entire £3 a head to see a current release – Finding Dory. Bargain. 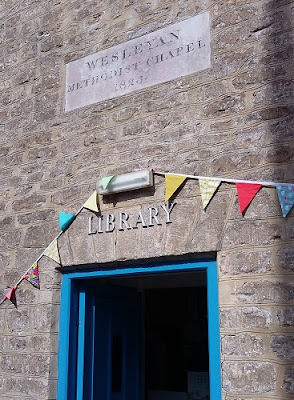 In Burton Bradstock, even the library looked picturesque. Libraries are another great option when the weather is rubbish – warm and dry with wifi, and plenty of books and comics to keep the children (briefly) occupied. Even if you’re on holiday, most libraries will issue a temporary card so you can borrow stuff too. Admittedly, it does help if you can remember to take along ID like a driving licence, and proof of address such as a recent utility bill. We borrowed a shedload of books from Bridport Library while my husband did the Palmer’s Brewery tour, and acquired a family friendly DVD (We Bought a Zoo) for 50p donation to the Burton Bradstock branch. If you’ve forked out to join English Heritage or the National Trust, it’s worth checking if there’s anywhere to visit near your holiday destination. Once you’ve paid the subscription, you can rock up at whatever combination of castles, forts, country houses or gardens you fancy. The National Trust also owns great chunks of the coastline, so that car sticker can bring free parking, handy for Burton Bradstock, the nearest beach. I negotiated a cheaper rate when renewing our annual family membership with English Heritage (£74 rather than £92.50), and we visited Lulworth Castle and Portland Castle while away. Tickets would otherwise have cost £16 and £13.70 respectively, for a family of four. If we visit Audley End now we’re home, we’ll have covered the annual membership, and any other visits to English Heritage sites will then effectively be free. If you’re signing up for the first time, always check if there are online discounts on offer, and see if there is any cashback on offer via sites like TopCashback and Quidco. Thankfully, many English Heritage and National Trust properties are immeasurably more child-friendly than my memories of dusty guy ropes and guided tours. Loads nowadays have trails to follow and lots of stuff you can touch, push, play with or dress up in. 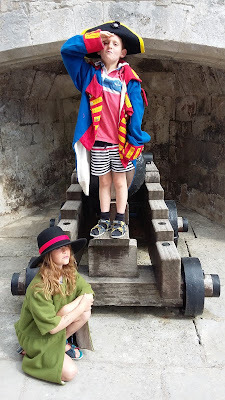 We particularly liked the interactive booming cannon exhibit at Portland Castle and the bat hunt and exhausting spacehoppers at Lulworth Castle. There are only so many worthy castles and libraries two children can take. One of the highlights of the holiday for our offspring was a trip to the Sea Life Adventure Park in Weymouth. Luckily, you can often get cheaper entry to theme parks and assorted Merlin Attractions like the Sea Life centres by using Nectar points, Tesco Clubcard points or vouchers from branded food. Kellogg’s, Birds Eye and KitKat have all run promos in recent years. Last year I hoarded “adults go free” vouchers on cereal packets so we could go to Legoland (post about visiting Legoland on a budget here). This year, we invested in Kellogg’s cornflakes to get two free adult tickets to Sea Life. It’s hardly a cheap day out, as even with the vouchers, the tickets still cost £47 for the four of us. This compares to prices from £75 when booked in advance, or from £94 if you show up on the day. However, we did spend a good 5 hours there, and entry includes a trip up the Jurassic Skyline tower on Weymouth sea front. The Sea Life centre itself is part aquarium, part theme park. 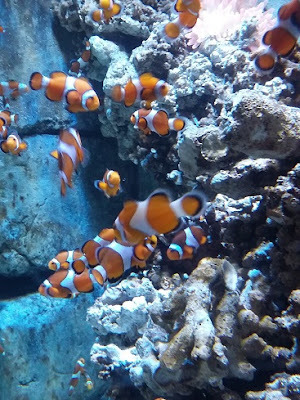 The children ran around gathering stamps in a little booklet at all the different exhibits of fish, sea creatures and other animals, including seals, otters and penguins. 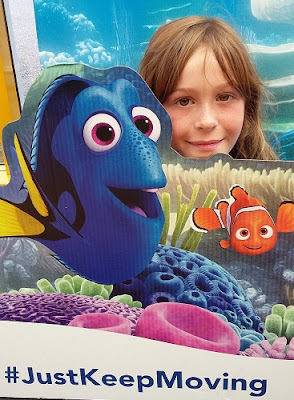 They were also given cardboard goggles and a sheet about spotting “Finding Dory” characters. The site also includes a few gentle rides like a crocodile splash roller coaster, some seaside amusements like 2p coin drops, and a big water play area with slides, squirters and a large barrel that empties cold water down your neck. Sarah Jane, the flying trapeze artist, with the ringmaster. While we were out and about, we picked up a voucher for Chaplin’s Circus which was visiting Bridport during our holiday, and decided to splash the cash on a family-friendly evening out. By booking online beforehand, and using the voucher code for free children’s seats, our tickets cost £28. If we’d rocked up at the box office, the same tickets would have cost £50 including booking fees. The circus was tiny but lovely, with 1920s costumes and no animals. 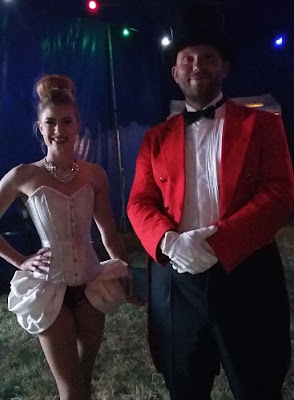 The acts included glamorous ladies on a slack rope, spinning hoop, silks and flying trapeze, plus a fire eater / juggler, a ring master who was also an escapologist and the endearing clown, Twiglet. My daughter was particularly delighted to win the raffle after the interval, and the inflatable beach ball and plaster animal moulds were particularly successful. Some attractions charge an arm and a leg, and then justify it by selling you an annual ticket, and encouraging you to come back lots of times (London Transport Museum, I’m looking at you). Fine if you live down the road, not such great value if you’re only in the area on holiday. My advice: hang on to the ticket, just in case. Last year during our solid week of rain, we ended up at Bovington Tank Museum. This is about the nearest you can get to tank heaven, if you are that way inclined. We paid £35 for the privilege of seeing tanks in the dry, and an all-action tank display while somewhat damp. Anyway, I not only managed to unearth the ticket before this year’s holiday, but we also squeezed in a trip before it expired. We rocked up on a Saturday afternoon and walked straight into the middle of a surreal pick’n’mix approach to armed conflict. They were holding a “Warfare through the Ages” day, so the whole place was pullulating with tents and re-enactors, everything from Roundheads and the Cavaliers and the American Civil War, via Napoleonic cavalry soldiers to the First World War. It was most odd seeing sixteenth century characters trying out sten guns, and some rather fetching waistcoats worn in the gift shop. We were also presented with free copies of Britain at War magazine on leaving. Bonus. PS My husband informs me that two of the tanks we saw driving around and firing their guns were Canadian Leopard tanks “and well worth seeing”. 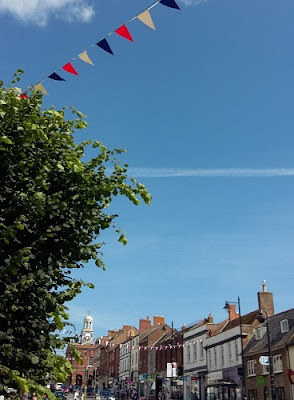 Church fetes, school fairs, village shows – I love them all. So I was particularly delighted that the Burton Bradstock Church Fete took place during our stay. 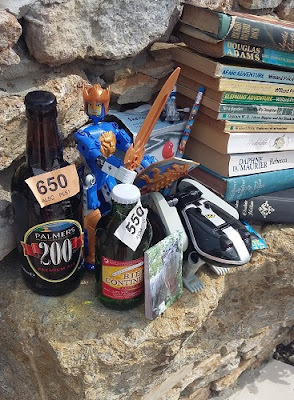 I’m putting this under a money-saving activity because we came away with a fine haul of second hand books, toys, games and a belting £1 investment in the tombola which won us two bottles of beer and a fruit shoot. 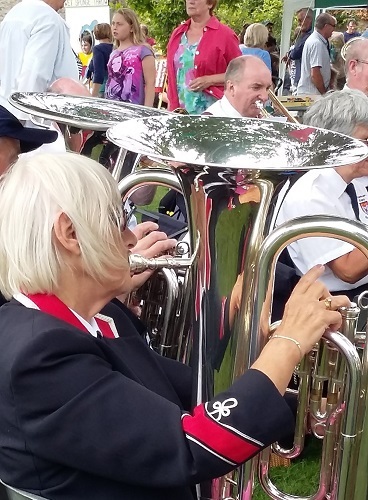 It was a truly trad fete complete with bat the rat, white elephant stall, cream teas by the WI and a big brass band. Fabulous. Brass band from the Burton Bradstock fete. Fabulous. If you’ve managed to get this far – congratulations. We really did enjoy our holiday, and even if wasn’t super cheap, we did make some savings here and there. What are your top tips for a thrifty family holiday? Best ideas for frugal fun? I’d love to know. Wow I love that post. You're the queen of frugal holidays ! Thank you 3-year challenge! It's all part of attempting to live on less and make the most it, so we get to enjoy ourselves on holiday without breaking the bank. 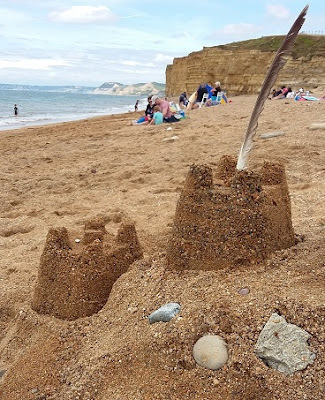 Great post – such a shame your fortnight IN Dorset coincided with our fortnight AWAY from Dorset, or you could have added Number 11 – call on another blogger for tea and cakes. Let me know if you are down here again, visitors always welcome!! No way! We would love to come for tea and cake if we manage to make it back to Dorset, thanks so much.